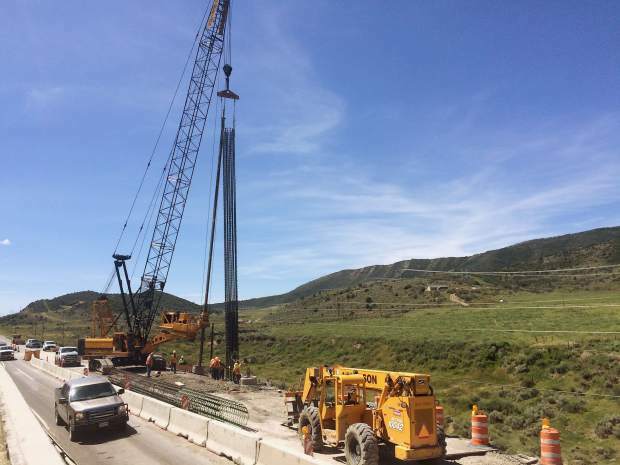 Crews prepare to construct a tieback system on the south side of McClure Pass, which incorporates high-strength steel strand anchors that are grouted in place to anchor the vertical caissons. Travelers headed over McClure Pass on Colorado Highway 133 this summer should anticipate construction delays, as the Colorado Department of Transportation begins work to control rockslide areas on the south side of the pass. Preliminary work has already begun, and construction will get underway in earnest on Monday, with anticipated completion by mid-October, weather permitting. The $1.3 million project has been contracted to Anderson Drilling, and is intended to reinforce a rock slip (fault) area between mile points 40.54 and 40.61, about five miles south of the Marble turn-off. “Specifically, the project will stabilize and reinforce a landslide below the roadway alignment to reduce the risk of further slipping or future rockslide events,” according to a CDOT news release. The work will involved excavation of approximately 3,750 tons (or 3,000 cubic yards) of rock material; drilling approximately 18 caissons, 60 feet deep, into which vertical and horizontal reinforcing supports (or rebar cages) will be positioned; installing 24-inch diameter rebar cages; constructing a tieback system, which incorporates high-strength steel strand anchors, that are grouted in-place to anchor the vertical caissons; repairing and reconstructing the damaged roadway; conducting earthwork and erosion control; and then final striping and signing. For the duration of the project, motorists can anticipate single-lane, alternating travel through the work zone. There will also be periodic full traffic holds of 15 minutes, or more as traffic queues must be cleared in each direction. Work hours will be Monday through Friday, 7 a.m. to 7 p.m. There will also be a 10-foot width restriction in place during work hours. And motorists are advised to avoid distractions when driving through the work zone. Two other area projects this summer will affect travel on CO 133, including resurfacing from the top of McClure Pass north to Redstone, and resurfacing and bridge repair at Bowie through Sept. 30. For more information, visit the project website at https://www.codot.gov/projects/us-133-mcclure-slip. The project public information line is 970-319-8893, and the email address is co133mcclureslip@gmail.com.